This upper east side family is a family of four (almost 5), two kids with one on the way, and they were running out of space. The option for this family was to reorganize what they currently had, or move to a larger and more expensive apartment. The closet space in this home was fantastic, but just needed some new, creative ideas to maximize the space. Another issue the family faced is that not all of the same types of things were in the same area. The mother's shoes were in the kids room, some of the husband's clothes were in the entertainment center and because of this the flow of the space was not functioning well for the family. Upon entry to the home there was a bench that was a catch all for bags, shoes, and jackets. The large stroller that had been housed in the lobby in the past was forced by the building to be housed within the apartment making this space critical to change up. We moved the bench to another area of the house, added shelving and bins for each family member, a longer coat rack was installed for coats and we were able to repurpose their old coat rack below the shelves for added storage. The large double stroller now has room where the bench used to be. The entry closet was reorganized with taller drawers, and a lower shelf to maximize the use of this space. We also added a chic entry table for added storage and an eye-catching piece upon entrance into the home. With a fairly small kitchen space we knew that each cabinet had to be used to it's fullest potential. Most New York spaces are lacking functional cabinet space specifically drawers, so with some creativity we were able to make the kitchen function despite it's smaller size. In addition the flow of a kitchen is aided when like elements are stored next to each other and the adjustable cabinet shelves are change to fit the size of the kitchen's items. On the wall that contained the stove and microwave pots, pans, and backing sheets replaced miscellaneous backing goods. Drawers were added in the deep lower cabinet to maximize the space. Tupperware and dried cooking goods were aded to the drawers to free up cabinet space on the other side of the kitchen. On the opposite side of the kitchen breakfast goods, peanut butter, jelly and honey and a basket of teas replaced spices and miscellaneous food. A set of drawers were again added for easily accessible kids snacks and canned goods for easy viewing. Larger baking sheets were placed on the side of the drawers and sauce pans were nested on top of the drawers. All spices and backing goods were housed in the middle cabinets and the dishes were condensed into one cabinet by adding an additional expanding shelf. And what's the most disorganized part of most homes? Under the sink. This sink got a huge transformation and now all cleaning supplies are easily accessible in drawers within a more economic shelving unit. The main living area had a lot of heavier furniture and we opened up this space by reversing their furniture, losing the 2 large shelving units that flanked the TV stand and moving the filing cabinet to a new spot in the home to create an actual office area with shelving. We were also able to feature some beautiful glasswork, family pictures and sentimental items with some new shelves. The hallway that lead back to the bedrooms housed two great additional closets. The linen closet and a very large closet for the husbands clothing and additional storage. We used the bench from the entry way as a place for the husband to put on his shoes and created a beautiful gallery wall to showcase family photos. The husbands clothes which originally were in two separate places were now all in one gorgeous organized area. Baskets made it easy for the linens to stay organized and easily accessible. The shelves throughout the house were labeled for the family and their house keeper for easy upkeep. 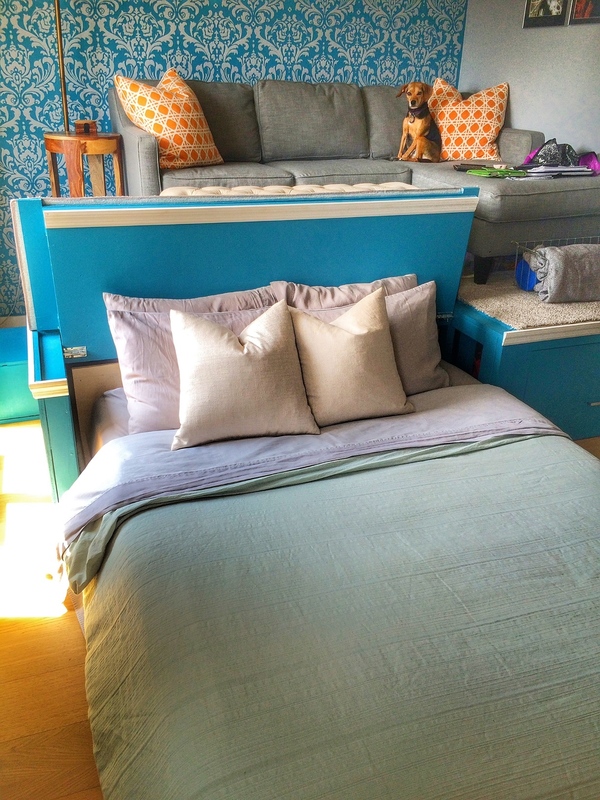 In one of the bedrooms for two of their children we wanted to maximize floor space. By stacking the bookcases vertically in the kids bedroom and adding shelves we were able to create useful space for the kids to do crafts. The closet also got separate bins for art supplies, a second clothing rod, and some drawers for additional clothing storage. The master bedroom begged for some sophisticated lighting, which we achieved with sleek his and hers floor lamps on dimmer switches attached to their night stands. The wife's closet got a makeover to accommodate sweater storage and late night baby feeding needs. The older children had figured out a way to hang on the shelves by the TV so we replaced the shelves with a corner cabinet to house their book and TV components. This also cleaned up the cords from the TV. This apartment has new life and extra space for this family. 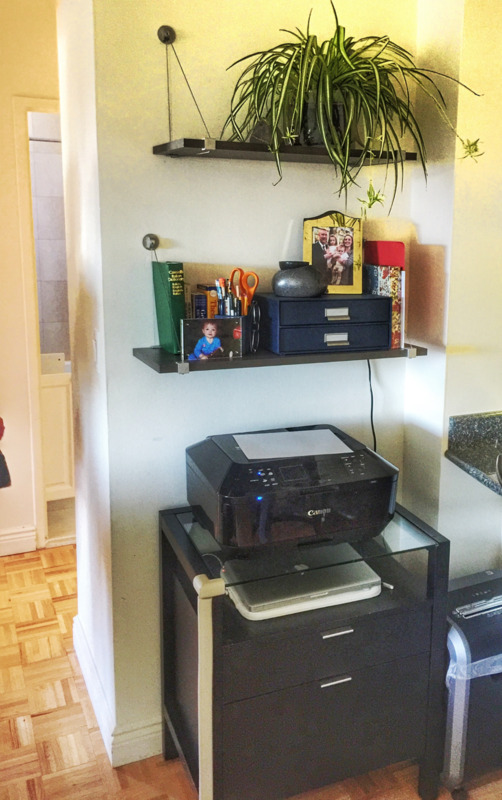 It just took a little creative organization and a few specific pieces to make this space functional and decluttered. Apartment CPR was totally worth every dime spent. I am a mom of two toddlers with a third on the way, busy! I was feeling so claustrophobic in my apartment with the amazing amount of kids clutter we have accumulated!! I was referred to Apartment CPR and am so pleased with how they reorganized our closets and found more space. They even redesigned our living room a bit so it felt bigger. AND MY KITCHEN!! I can find everything now. All the items I use the most are at my finger tips. In general everything in our apartment has a place and we have space to breath again. Ahhh. (That's me breathing, in my apartment!) This is such a big deal for me because I work from home. I really only get out for occasional errands and weekly date night. So a huge THANK YOU to the CPR team! And a special kudos for working with my kitty in the house riding on their shoulders and my 3 1/2 yr old daughter "entertaining" them.